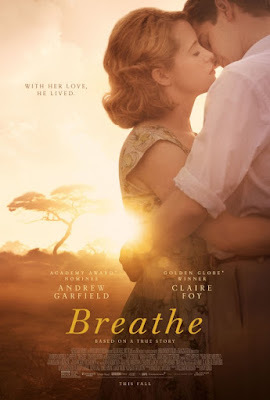 We're happy to offer our DC readers the chance to win Run of Engagement (ROE) passes to Andy Serkis' directorial debut, Breathe, starring Andrew Garfield and Claire Foy. SYNOPSIS: For his directorial debut, Andy Serkis brings to life the inspiring true love story between Robin and Diana Cavendish,an adventurous couple who refuse to give up in the face of a devastating disease. After a fairytale-like courtship, Robin is struck down by polio at the age of 28, confined to a hospital bed and given only a few months to live. With the help of Diana's twin brothers and the groundbreaking ideas of inventor Teddy Hall, Robin and Diana dare to escape the hospital ward to seek out a full and passionate life together - raising their young son, traveling and devoting their lives to helping other polio patients. These passes are good for you and one guest, beginning October 23rd at Landmark E Street and Landmark Bethesda Row theaters. To enter, simply end an email to punchdrunktrav@gmail.com with 'Breathe ROE' in the subject line. Include your full name and mailing address, plus your favorite film in which Serkis had an acting role. Winners will be selected and contacted on Thursday, October 19th. Good luck! Breathe opens in DC on October 20th.